Another Grand Bahama businessman has come forward to assist the initiatives of The Grand Bahama Cultural Carnival Company [GBCCC] as it presents ‘The Grand Life – Grand Bahama Island: The road leading to Bahamas Junkanoo Carnival’. Mr. Mario Donato has sponsored a prime shop space in the Regent Centre, Down Town Freeport for the business operations and sale of costumes and authentically Grand-Bahamian products for GBCCC, a Bahamas Junkanoo Carnival company. Grand Bahama Island is poised to benefit from events leading to Bahamas Junkanoo Carnival May 7th – 9th 2015, with its own events scheduled for April 17th – 18th 2015. GBCCC will also proudly represent Grand Bahama Island in Nassau in May 2015. This corporate donation comes on the heels of an appeal from Prime Minister, The Rt. Hon. Perry G. Christie for Corporate Bahamas to support Bahamas Junkanoo Carnival, as it is intended to not only be another venue for Junkanoo to be showcased, but will transform Junkanoo and Bahamian arts and culture into a profitable industry from which all Bahamians can benefit. In his address to Corporate Grand Bahama in late August, the Prime Minister passionately expressed, “This is a national major event and I want Grand Bahama as a major participant”. Mario Donato is the second Grand Bahama businessman to come forward in the last few weeks to assist in ensuring that Grand Bahama benefits from Bahamas Junkanoo Carnival. Grand Bahama businessman, Peter Hunt was the first to provide funding to each of the Junkanoo Groups for the development of prototypes for the carnival costumes to be sold by GBCCC under ‘The Grand Life’ theme. GBCCC is a coming together of Junkanoo Groups and authentic Bahamian product providers throughout the community of Grand Bahama in an effort to become a premier Carnival Company in The Bahamas. GBCCC will provide the highest level of quality costumes, other Grand Bahamian-made products, and exciting opportunities for the staging of Carnival events. GBCCC’s mission is to become a leading cultural carnival company that enriches the lives of culture seekers, and brings significant benefits to those who make a living from the culture of The Bahamas. It is GBCCC’s objective to foster community development while utilizing culture to create entrepreneurs. The primary goal of the company is the promotion of entrepreneurs in the area of cultural product development for The Bahamas. This NGO will make an annual contribution to local Junkanoo Groups to continue the growth and development of the national festival of The Bahamas, and focuses on the advancement of authentically made Bahamian products. Phase II of the organization involves the development of a Grand Bahama Cultural Museum and Junkanoo Village to support the advancement of culture on GBI; to provide a venue for visitors and locals to experience culture; and to house winning Junkanoo pieces year-round. 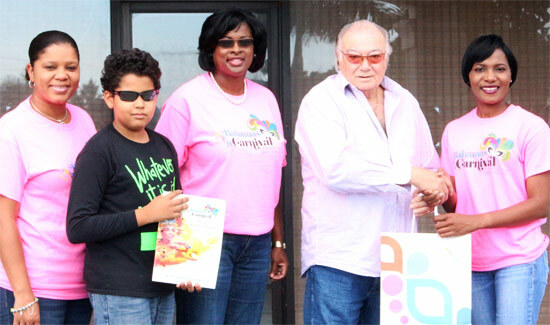 Photo Caption: Donato gives to GBCCC: From L to R: Sanique Culmer, Ministry of Tourism and Bahamas Junkanoo Carnival Committee Member; Mario Donato Jr.; Mario Donato Sr., Local Businessman; Ginger M. Moxey, Immerse Bahamas and Consultant to BNFC; and Carmel Churchill, Grand Bahama Island Tourism Board and Bahamas Junkanoo Carnival Committee Member.